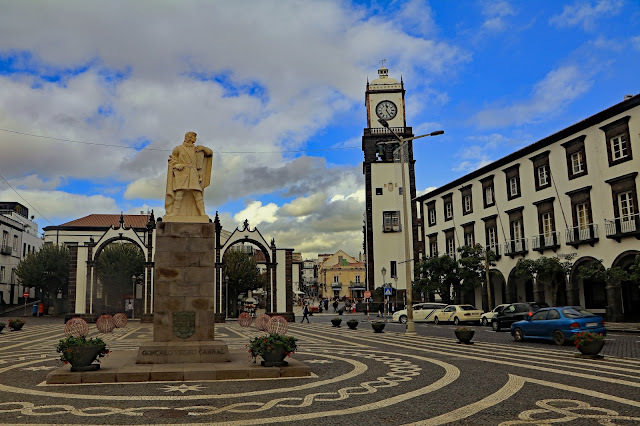 On the 25th day after leaving Southampton we make our final stop on the island of Sao Miguel in the Azores, one of two Autonomous Regions of Portugal, along with Madeira, where we made our first stop. It consists of nine volcanic islands in the North Atlantic Ocean about 850 miles west of continental Portugal, and about 1,196 miles southeast of Newfoundland, Canada. 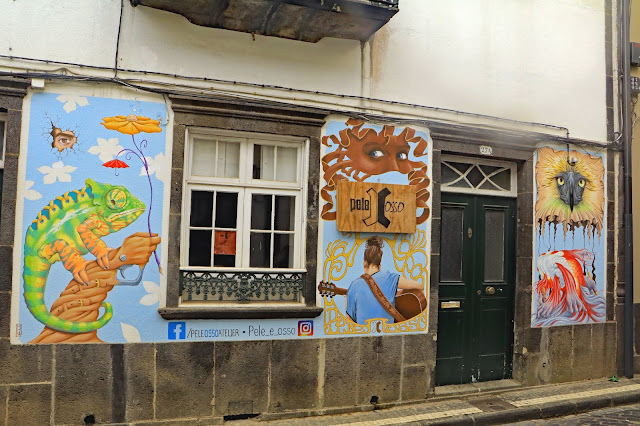 Our port of call was Ponta Delgada an old town of characteristic narrow roads, and winding cobbled streets. The buildings are whitewashed with wooden balconies, the streets and squares are paved with mosaics and ornate churches decorate almost every street. 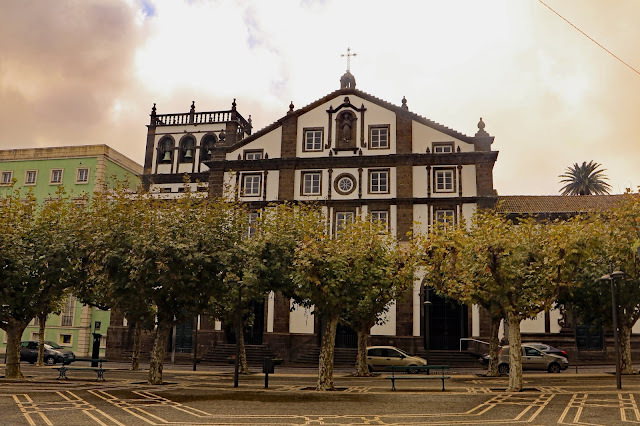 The first church you see as you walk out of the cruise terminal is that of Sao Pedro or St Peter. The single-nave church is constructed in masonry stone, plastered and painted in white, with the bell tower to the left. This church dates back to the beginning of the 16th century and is one of the three oldest churches - as well as one of the smallest - in the country. Walking along the harbour from there, we came across the city gates. This is the view from the harbour road looking towards the gates, with the statue of explorer Goncalo Velho Cabral in the foreground, and the tower of the church of São Sebastião to the right. This give a good view of the ornate mosaics to be seen in many of the squares and streets. Walking through the gates, we can see the front facade of the church. 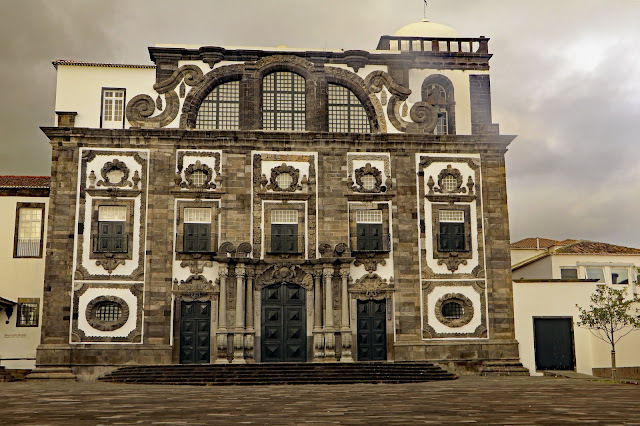 The Parish Church of Ponta Delgada dedicated to São Sebastião. The exterior includes notable Manueline and Baroque doorways. You can also see that it is has Christmas decorations on the front and you can just see the tops of reindeer, which are pulling a sleigh! Walking further along the harbour road, we come across yet another cobbled square, with statuary mosaics. 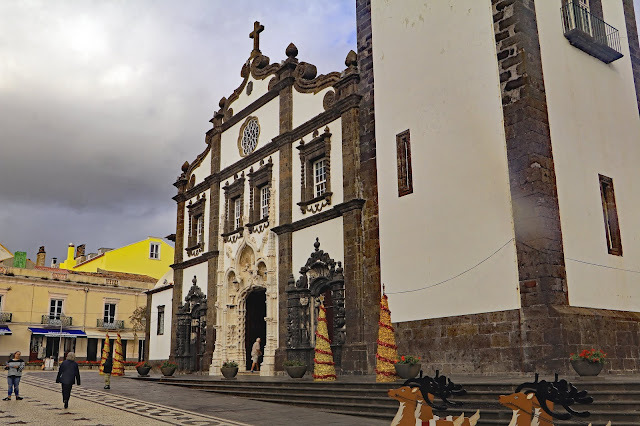 This is the church of St Joseph or Igreja de Sao Jose which is located on the edge of the square. 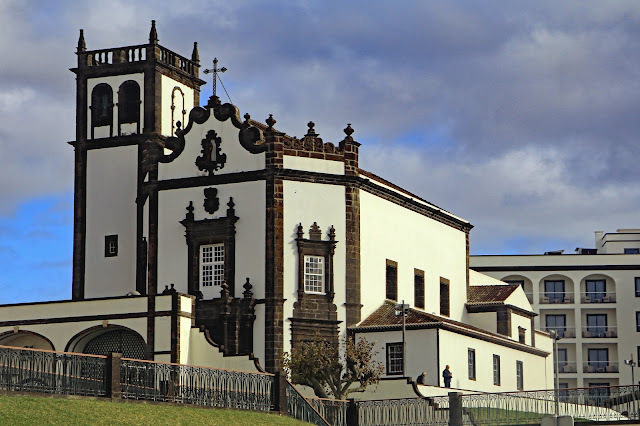 Away from the sea front, towards the centre of the town we came upon the Carlos Machado Museum, which has been housed since 1943 in the former Convent of Santo André. The collection offers eclectic exhibits of historical artifacts, art & taxidermy. Just to demonstrate that the town has buildings other than churches, I enjoyed the wall art on this gift shop on one of the narrow lanes. All good things must come to an end, and in the evening we departed Ponta Delgada to make our way back to Southampton. 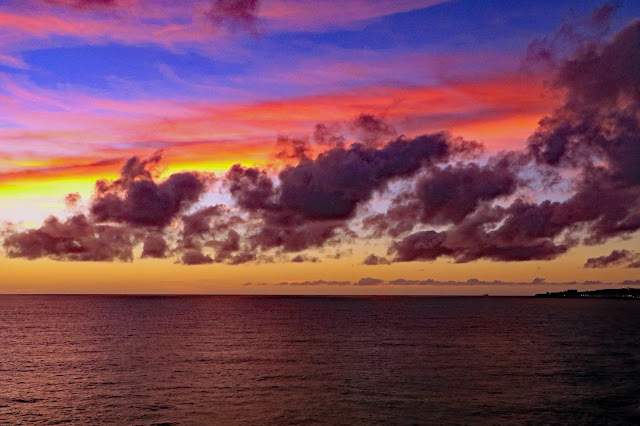 I think that this dramatic evening red sky provided a fitting end to what had been an unforgettable holiday!